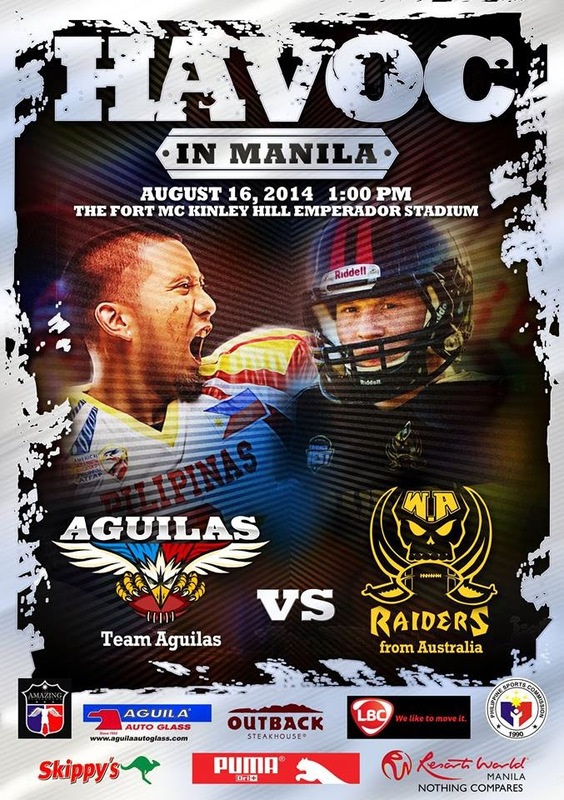 The Pilipinas Aguilas team will have a friendly match against the Raiders (Australian State Team) at the Havoc in Manila event happening on August 16, 2014 (1-5pm) at Emperador Stadium, Mckinley Hill, Fort Bonifacio, Taguig City. The Raiders will also train our National Team training pool and share their knowledge and expertise on football. This collaboration will help our players grow in experience to prepare for the upcoming 2016 IFAF Asian official games to be participated by 8 countries. The American Tackle Football Association of the Philippines (ATFAP) has started its program for the development of American football in the country with the creation of the I Am Pilipinas Aguilas Club Training Pool (ImPACT) Program. This American football club will be the official training pool for the National Team for official local and international games under ATFAP and the International Federation of American Football (IFAF). Any interested players must be at least 18 years of age. The objective of the sports clinic is to invite players, coaches and referees (both Filipinos and foreigners) who have experience or willing to be trained in American Football. This is an opportunity to tap potential good players to be included in the players pool of Pilipinas Aguilas, the National Team. Those who dream to be part of the National Team must first be physically fit, have a Philippine passport and have a serious passion for football. This will be the first ImPACT Program. 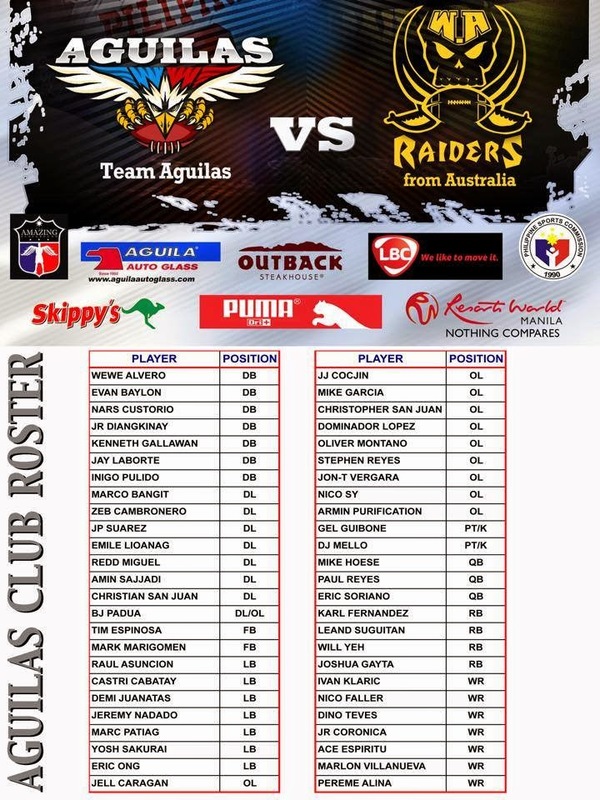 Anyone interested in the sport can attend and also meet up-close the players of the Pilipinas Aguilas and the Aussie Raiders. Tickets will be sold at the stadium's entrance gate at PhP100. Try to be there early by 11am or 12nn to enjoy any pre-game festivities and for pictorials with Aguilas and Raiders players, and to also witness their pre-game practices. On August 17, 2014, ATFAP will have a free open football clinic to be led by the Australian team and the Pilipinas Aguilas at 10am to 2pm at the Emperador Stadium. This event is sponsored by Skippy’s Bar and Grill, Outback Steak House, Remington Hotel, Resorts World, Puma Socks, LBC, Aguila Glass, Amazing Playground, Emperador Light, PCSO and PSC.